According to the U.S. Census Bureau, more than 10 million single mothers are living, working and parenting more than a fourth of children under the age of 21 in the United States today. Single parenthood can be difficult, but single moms across the country work hard to complete their educations and find adequate work, setting goals that they know will help them provide a better future for their kids. Although most single mothers are employed, many of them are underemployed or simply are not paid enough to make ends meet with one job. In fact, 90 percent of single moms in the U.S. earn less than $40,000 annually. Nearly half of these working single moms work more than one job, and 67 percent of them work more than 40 hours every week. In spite of the fact that collectively single moms are owed almost $40 billion in back child support, fewer than 5 percent of them receive any governmental assistance. The She Cares Foundation seeks to make a difference in the lives of these dedicated, hard-working moms. It provides opportunities designed to empower single mothers and help them become more self-sufficient. Yolanda Anderson, the founder of the She Cares Foundation, is committed to helping single mothers achieve their goals. Dr. Poneh Ghasri, West Hollywood dentist, was pleased to have the opportunity to join such renowned players as Nick Young, J.R. Smith, Darius Morris, Matt Barnes and many more at the She Cares 3rd Annual Celebrity Basketball game on August 25, 2012. 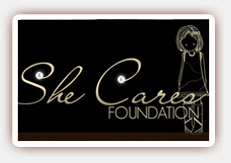 She is a proud supporter of the She Cares Foundation and for what they stand for.